There is a grand tradition of fiddlers who repair their own instruments, as I said. Just because you happen to be a player does not make you useless, after all. To repair your own instrument gives great satisfaction. I have one fiddle which is over two hundred years old which I found in bits, with all her varnish stripped. She would surely be worth more financially if I had had a restorer fix her, but I did it myself, she sounds and plays wonderfully, and I get a real kick out of the fact that I saved her myself. Because, believe me, she was kindling-wood before. That brings me to an important point. This is one rule that you must learn to obey before all others and which you should bear in mind whenever you touch an instrument with a mind to repair. Never, ever, EVER do any repair that cannot be completely undone later. This is particularly true with older instruments, which are not only beautiful to play and listen to but are works of art in their own right. Okay, so a workshop fiddle from the Mittenwald may be no Mona Lisa, but it’s on a par with the old etchings that were produced in similar numbers and are now so sought after. With my old violin, I have done nothing that can’t be undone. I repaired her tragically splintered top using proper luthier’s hot hide glue and tiny cleats of top-quality instrument-grade spruce. Someone had committed the cardinal sin of stripping the varnish, and I know my own limits there, so I finished her with French Polish, which sits on the surface of the wood and can be removed completely with alcohol, which itself evaporates and leaves no residue. I made no changes to the structure of the violin. No sandpaper did I rub her with, nor knife cut her. In short, a real restorer could easily take her back to the state she was in when I found her and perform a complete restoration and repair and you would never know that I had done anything at all. Indeed I hope that after I am dead and gone, someone will do just that, and give her another two hundred-odd years of music-making. I feel rather satisfied that because of me, someone yet to be born will know the joy of hearing this instrument’s voice. I am just her caretaker. With violins we are actually quite lucky because so many of the parts are not actually “of the violin” but effectively are “consumables.” These include the tuning pegs, endpin, bridge, saddle, top nut tail-gut and tailpiece. All of these may be replaced by the player. Maybe you won’t get it quite right first time, but the learning itself is satisfying. More structural, and to be treated with much more care, are the soundpost and the fingerboard. Nevertheless, these too will have to be changed sometime in the life of the violin, and they can be replaced by the player. If you are a fiddler on a budget you should know that it is still possible to find very old European violins that need a little work to turn them into really very nice instruments indeed, at very affordable prices. Almost invariably these instruments are light-years better in sound and quality that the kind of new instruments that sell for up to a thousand pounds or even much more, and as for the junk Far-Eastern fiddles that crowd the bottom end of the market, trust me, it won’t take but six weeks for even a complete beginner to realise he or she is playing a cigar-box on a stick. My word, yes! 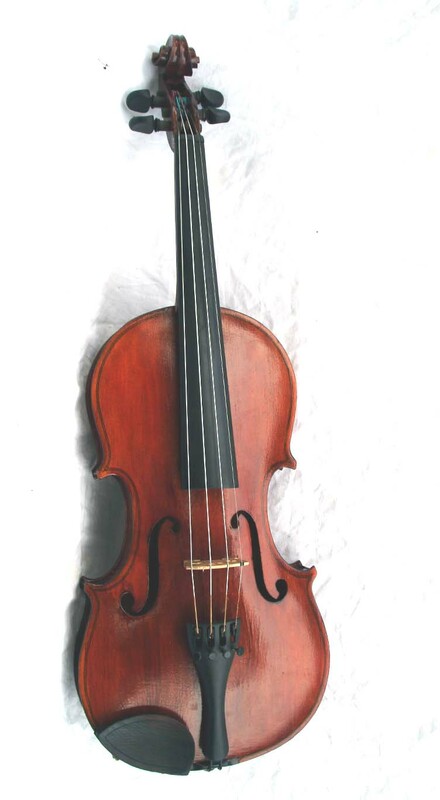 I have a nice fiddle, with lengthened neck added in 1890’s, made a few years before the French Revolution. I added a new bridge, formed to the curve, heart in mouth in case the sound post dropped out. Sounds fine now; I have to laugh a little when at brocantes I pick a shameless wreck of a violin and the stallholder assures me it is old therefore it is a priceless relic and worth the ridiculous price they are asking. I don’t think I’ve found a decent one ever at a brocante. Hi thanks for the feedback! I am going to do a post on measuring,cutting and setting a soundpost using tools you can make yourself soon, so please check back.